This is a sponsored post written by me on behalf of NETFLIX. One of the things I absolutely love about the warm weather is that the kids get to go outside and play with their friends around the neighborhood. After school they come in, eat a snack, work on their homework and then they are out the door until it's dinner time. So far Spring on our side of town has been up and down regarding the weather. For instance, this past weekend was perfect and then on Monday it rained. On rainy days or weekend mornings before the kids go outside to play, I know exactly what they're going to want to watch, Netflix. Netflix has been growing and growing and now with their Just For Kids section I know that I can put on our Playstation 3 and leave the television or movie selection up to both my kids. Not only is it easy for kids to use, but it also has all of their favorite television shows and movies on there for them to watch. It's definitely been a life saver for me to keep the kids entertained on days when I'm trying to get the house cleaned or have work to do. Now there are times when my kids argue over what to watch. This is pretty easy for me as I'll then tell them to take turns on watching a show or I'll put on a show they both love to watch, like, Jake and the Never Land Pirates. I can't tell you how many times my kids have watched, memorized and enjoyed that show. Netflix is constantly adding new shows, movies and episodes of shows for my kids to watch. Netflix has recently added new content from Hasbro, Disney Jr. and Cartoon Network, which includes shows like, My Little Pony, Caillou, Johnny Test and so much more. The options of different shows to watch are endless. Right now my daughter is obsessed with H2O: Just Add Water and my son, Thomas the Train. And on Family movie night it's great that we can all sit together and watch a movie that either we've seen before and loved or something new. Don't have Netflix yet? It's easy to just sign up and the first month is completely free. After you've experienced what Netflix is all about trust me, you're not going to want to cancel that membership. It's great for the entire family and it's just going to get better and better. Don't have a Smart TV, that's not a problem. You can stream Netflix off of your home computer, a gaming console, blu-ray player, tablet or smart phone. It's great that you can take it anywhere with you. This definitely helps when I'm at a doctor's or dentist appointment with the kids. Letting them watch a show that they love on my Iphone before seeing the doctor is always comforting and keeps them entertained. 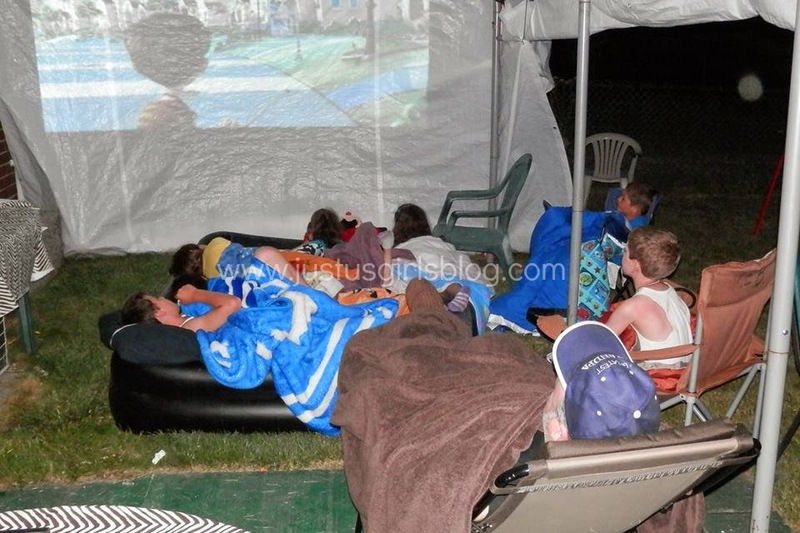 We also took our laptop to my in law's annual Victorian Campout Weekend and let all the kids watch a movie outside. They loved it! Definitely will be borrowing their projector during this Summer so we can enjoy more movies outside with friends and family. What are you watching on TV with your family? Netflix has family favorites from Disney, Disney Jr., Hasbro, Cartoon Network and Dreamworks that are available to stream anytime, anywhere. And streaming is easier than you think! Download the free app on your iPad, click on the Netflix app on any gaming device, go to the website on your computer – and you’re in business. Check it out here!